Wakanda is a wonderful new location in the MCU that will be fully explored in the upcoming standalone Black Panther movie. Today, we get to go further inside this African city with never-before-seen concept art from Marvel Phase 3. The art arrives with the Blu-ray and DVD release of Doctor Strange, which hits stores on February 28, but is now available on VOD and streaming rental services. The Doctor Strange home video release contains a special featurette video that looks at the entirety of Marvel Phase 3 and what is planned in the coming years. That includes the exciting release of Black Panther. Disney has quite a few surprises in store for Marvel fans heading through the rest of this decade. And as you can see in the art included below, that includes an extensive trip to the wonderful world of Wakanada. We don't see too many new characters revealed, but we do catch a few glimpses of Chadwick Boseman as T'Challa, suited up and ready to ride on top of cars. We also get to see a council room. Other cast members in this sure to be epic adventure include Michael B. Jordan (Creed, Fruitvale Station), Academy Award winner Lupita Nyong'o (Star Wars: The Force Awakens, 12 Years a Slave), Danai Gurira (The Walking Dead, upcoming All Eyez on Me), Martin Freeman (The Hobbit trilogy, Sherlock), Daniel Kaluuya (upcoming Get Out, Sicario), with Academy Award nominee Angela Bassett (American Horror Story, London Has Fallen), with Academy Award winner Forest Whitaker (Rogue One: A Star Wars Story, Lee Daniels' The Butler), and Andy Serkis (Avengers: Age of Ultron, Star Wars: The Force Awakens). Black Panther has one of the best ensemble casts ever assembled for a Marvel movie outside of the Avengers films. Also coming into play are Letitia Wright (Urban Hymn, Glasgow Girls), Winston Duke (Person of Interest, Modern Family), Florence Kasumba (Captain America: Civil War, Emerald City), Sterling K. Brown (Whiskey Tango Foxtrot, The People v. O.J. Simpson: American Crime Story) and John Kani (Captain America: Civil War, Coriolanus). Ryan Coogler (Creed, Fruitvale Station) directs from a screenplay he co-wrote with Joe Robert Cole (The People v. O.J. Simpson: American Crime Story). The movie will open in U.S. theaters on February 16, 2018, to coincide with Black History month. Black Panther follows T'Challa, who, after the events of Captain America: Civil War, returns home to the isolated, technologically-advanced African nation of Wakanda to take his place as King. However, when an old enemy reappears on the radar, T'Challa's mettle as King and Black Panther is tested when he is drawn into a conflict that puts the entire fate of Wakanda and the world at risk. 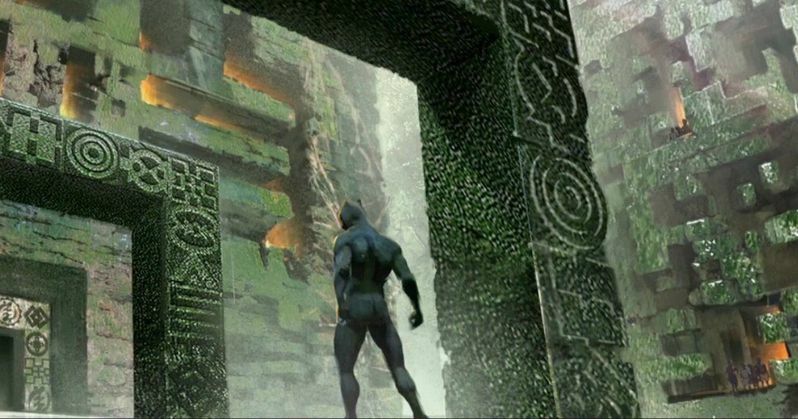 You take can a first look at the exciting Black Panther movie with this latest concept art. The movie is currently shooting in Atlanta simultaneously with the big blockbuster epic adventure Avengers: Infinity War, which will also include Black Panther and some of the other new characters being introduced in this first solo movie. Take a look and explore all the sights Wakanada has to offer.